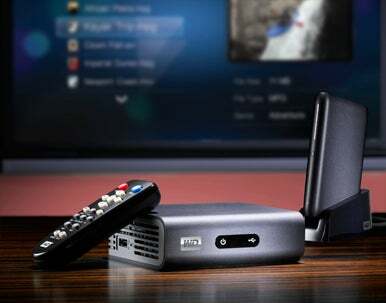 Western Digital on Wednesday introduced the $150 WD TV Live Plus, the latest version of its TV-connected media player hardware. The big difference between the new model and the WD TV Live is support for streaming content from Netflix. It incorporates the latest Netflix interface, which lets members browse and select movies and TV shows directly, as well as access programs already saved in the Watch Instantly queue. Netflix joins streaming audio and video from YouTube, Flickr, Pandora, Live365, and MediaFly. The device connects to your network via an Ethernet port, but you can also purchase a USB wireless adapter separately if prefer Wi-Fi. In addition to streamed content, you can access media—with video at resolutions up to 1080p—stored on USB hard drives, digital cameras, camcorders, and mass storage devices. There are two USB ports, so you can connect multiple devices at once, and their content will show up in a single list in the on-screen display. You can also play content from a Mac or PC as well as from a network drive. The WD TV Live Plus supports numerous audio, video, and image formats, including FLAC audio and MKV video, as well as playlists and subtitles (like all other non-Apple hardware, however, it can’t play iTunes Store protected content). It has an HDMI port for connecting to your HDTV (plus composite and component video options as well) and can output Dolby Digital and DTS audio through its optical digital port.